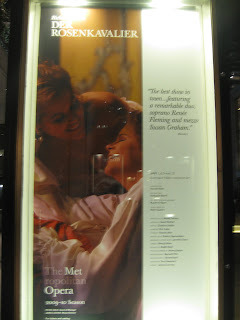 Tonight I'm taking my mother to see the last Der Rosenkavalier at the Metropolitan Opera. Last fall, I saw the dress rehearsal and a regular performance. Last Saturday, I saw it broadcasted live in HD at the movie theatre. I do love it and wish it would be on every season (although I might need to nap during that 2nd act, after the Presentation of the Rose of course). There's a rumor that this is Susan Graham's last Octavian. I hope it's not true. I did ask her about it last fall, she smarty-pantsly said that it wasn't her last because she'd sing it in January. She was non-committal about the rumor that she'll be singing the soprano role of the Marschallin some day in the future (possibly at the Houston Grand Opera). So, this could be the last. When the trio subsides tonight, there will no doubt be an elusive tear or two forming in my eyes. Cara: RahRah, Is this opera? Me: Yes. And I know her. She's my favorite soprano. Cara: I don't like opera. Me: Well, you liked Susan Graham. She's an opera singer. Cara: [pensive pause] Well, I like Susan Graham, she's my favorite. I wonder what they do with all those posters once the opera has completed its run... Enjoy the show tonight! I contemplated taking in the HD repeat b/c I love it so much.